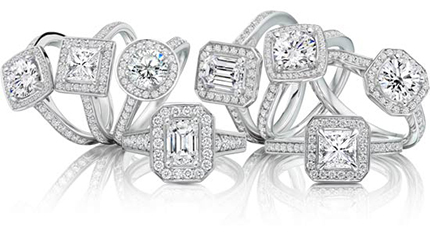 Raphael Collection™ diamonds are carefully selected for their Cut, Colour and Clarity. We use a minimum standard of F/G Colour, VS Clarity to give every ring maximum fire and brilliance. We only source conflict free diamonds. Diamonds are measured in terms of weight, not size. One carat is equal to 100 points. Two diamonds of equal weight can have very different values, because the quality is still determined by the colour, clarity and cut. To transform the diamond into a beautiful gem, it is cut with precise facets. Well cut diamonds have amazing brilliance and fire. This is caused by light reflecting off the diamond’s surfaces. The key to desirable fire and brilliance is proportion. Light striking a shallow cut diamond or a diamond cut too deep is lost through the sides or bottom and is not reflected back to the top. While many diamonds appear colourless or white, they may actually have subtle yellow or brown tones that can be detected when comparing diamonds side by side. Colourless diamonds are the rarest and most valuable of all. Clarity is an indication of a diamond’s purity. Clarity is determined by a diamond’s naturally occurring internal characteristics called inclusions. These characteristics are sometimes not visible to the naked eye and they are what make each diamond unique. The most highly prized diamonds are those with no inclusions, otherwise known as flawless diamonds. Why choose Platinum over 18ct White Gold? Platinum is not only denser but also stronger than Gold. It is ideal for setting diamonds in because it is very difficult to distort Platinum and this makes the setting the perfect host for diamonds. The setting will require less maintenance over the years. Platinum is a naturally occurring lustrous white metal and never discolours or tarnishes. Gold however is naturally yellow and is mixed with elements such as Palladium in order to give it a whiter hue. The resulting white gold alloy is often rhodium plated to give the same bright white finish that exists in Platinum. Classic design and quality never goes out of fashion. Neither will Platinum. The true measure of value is rarity. Platinum is one of the world's rarest precious metals, being 35 times rarer than gold. A total of 10 tons of ore are required to produce just 1 ounce of platinum. In comparison, only 3 tons of ore are required to produce 1 ounce of gold. Platinum costs 4 or 5 times as much to refine than gold. Platinum is much purer than gold. All Platinum pieces in The Raphael Collection are 95% pure, hence the Pt950 symbol on our hallmark, whereas 18ct Gold is 75% pure. Platinum is a more dense metal than gold. This means that the same item of jewellery will weigh approximately 1.4 times heavier in Platinum than in 18ct Gold. Is Platinum a difficult metal to work with? If looked after properly it should not need to be repaired. Platinum requires a higher level of craftmanship and requires great skill to work it. What other benefits does Platinum have? Because of its pure properties, Platinum is fully hypoallergenic and will not irritate the skin. Allergic reactions may occur when wearing jewellery other than Platinum due to the alloys used in processing the metal. Signs of wear, including scratches, will inevitably appear in all precious metals, even in Platinum. However due to Platinum's durability and strength, the scratch is merely a displacement of the metal and none of its volume is lost. Platinum is pure, an expression of integrity, a reflection of inner truth. Platinum is the metal of choice, when only the best will do. That the name Platinum originates from the Spanish word Platina, which means “little silver”. All the Platinum ever mined would fit into a typical living room. Annually, only 130 tons of Platinum are mined compared with 1,782 tons of Gold. A six inch cube of Platinum weighs 75 Kilos – about the average weight of a man. Platinum is often mined almost a mile underground and at temperatures exceeding 120 degrees Fahrenheit. Platinum’s melting point is almost double that of gold. One gram of Platinum can be made into a wire 2 kilometres long. Platinum was used by the South American Indians before the 15th Century but they could not melt it. News of Platinum spread in Europe shortly after being discovered by astronomers Antonio de Ulloa and Don Jorge Juan y Santacilia in 1735. Platinum started to be used in jewellery in Europe about the mid nineteenth century. There is no Platinum in a Platinum record! It's plastic dipped in silver! Palladium is a rare and lustrous silvery-white metal and belongs to the same group of metals as Platinum. It was first discovered by William Hyde Wallaston in 1803. Although Palladium shares similar properties to Platinum it is much less dense - an identical piece of Palladium jewellery will weigh 50% less than in Platinum. The weight of Palladium is very similar to that of 14ct gold, but because Palladium is historically less expensive than Gold per gram, Palladium jewellery is generally more competitively priced. Why use Palladium in Jewellery? Again, as Palladium is rare it is considered precious. Its properties and characteristics make it ideal for jewellery. Palladium is naturally white and so it will never tarnish or change colour. Palladium rings never need to be rhodium plated. Palladium rings can be sized just like other precious metal jewellery. Palladium is hypoallergenic so it is ideal if your skin is sensitive. Palladium is harder than Platinum meaning your jewellery is extremely durable. Palladium is highly fashionable and its popularity is growing rapidly. All rings in The Raphael Collection are manufactured from seamless Palladium tubing. There is no current legislation to hallmark Palladium Jewellery in the U.K. However all Palladium Jewellery in The Raphael Collection carries our Pd950 stamp – our guarantee to you that all our Palladium is 95% pure.